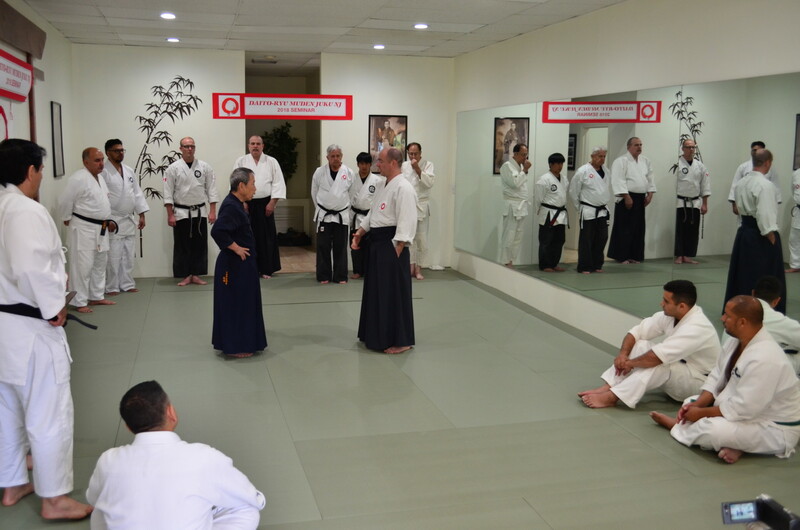 Daito Ryu Seminar with Hiroo Iida ,Portugal,Early November 2019. 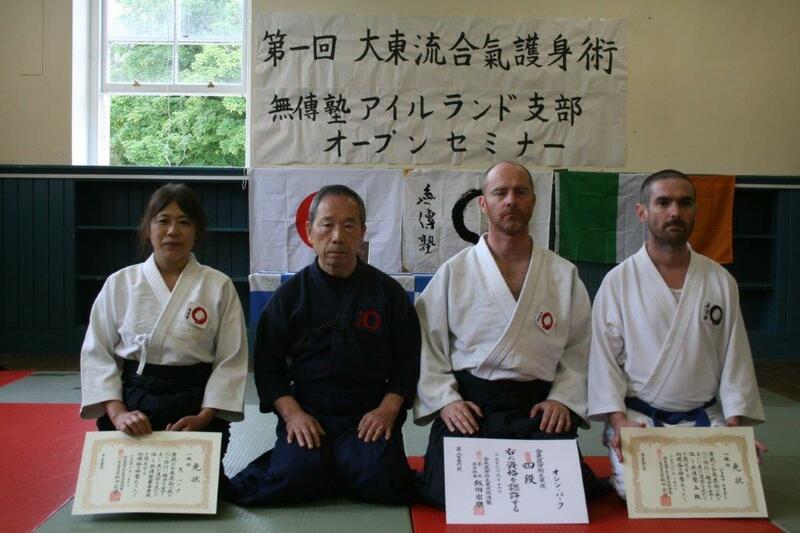 Report of Daito Ryu Seminar with Hiroo Iida and Ole Kingston in Thomastown, Kilkenny, June 2018. 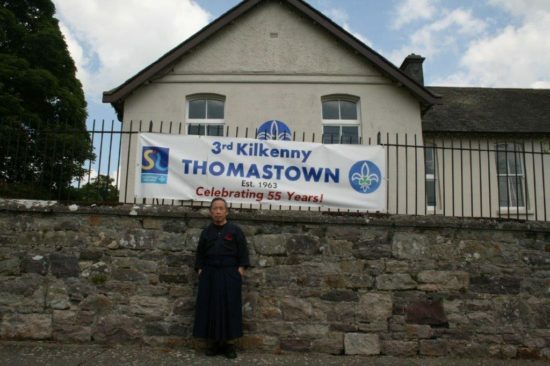 A unique event took place in the village of Thomastown, Kilkenny this June. 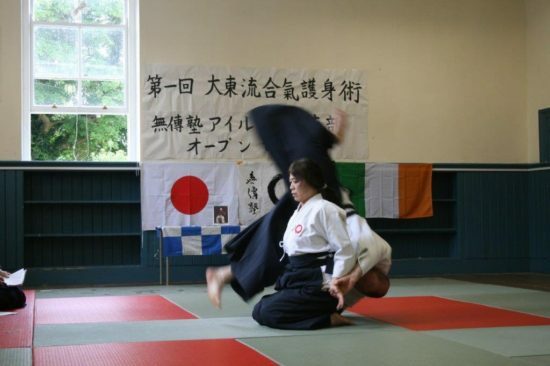 It was the venue for the first ever Irish seminar in the traditional Japanese art of Daito Ryu Aiki jujutsu. 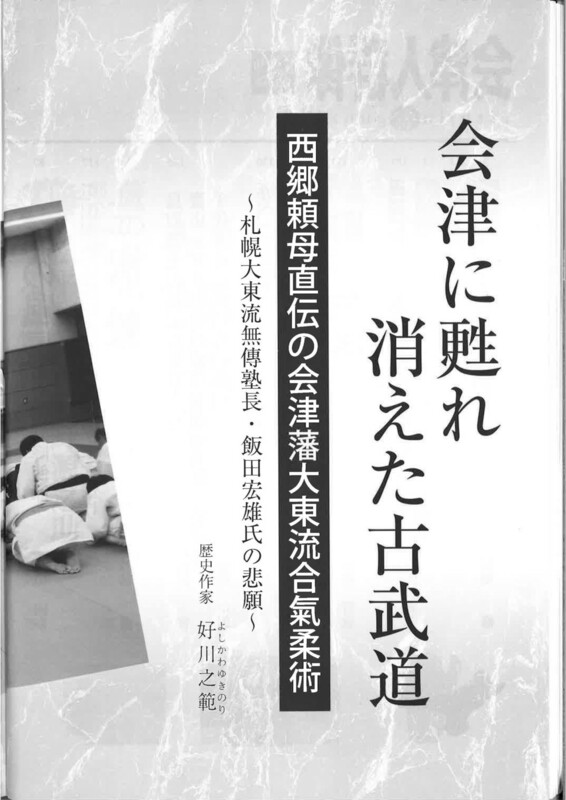 Moreover, this seminar also had the distinction of being taught by two instructors from two ryu ha (factions) of the art: Hiroo Iida, a shihan (master level) instructor and lineage student of Kodo Horikawa, and Ole Kingston jun kyoju dairi,(licenced teacher), lineage student of Okamoto Seigo shihan, one Horikawa’s earliest and highest-level students. 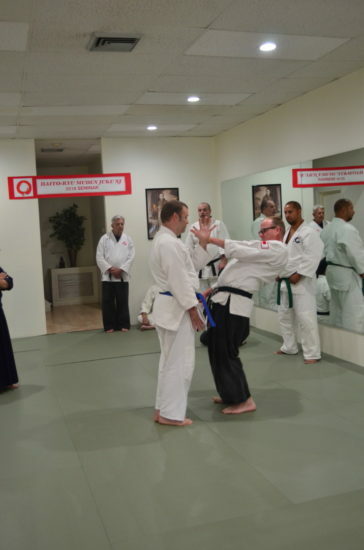 These two instructors presented methodology stemming from a common source, but they also showed distinct aspects of the Daito ryu that informed each other. Practitioners were thus able to receive a comparative, broad and comprehensive overview of the principles of this fascinating art. This is a problem in Ireland as much as anywhere else, so I organised this seminar to help remedy this situation. Attendees came to Thomastown from all around the world to avail to the experience to train with Ole and Iida Sensei. Countries represented at the seminar included Japan, the USA, Denmark, Portugal, Britain, France, Finland, Belgium and of course Ireland. Practitioners came from a background of a variety of arts, including various Ryu ha (branches) of Daito Ryu, Aikido, Koryu Bujutsu (classical Japanese martial disciplines), Jujutsu and Chinese arts. The fact that such a diverse group of people managed to train so well and profitably together over a weekend seminar is a testament to the spirit of all those who attended and to the ability of the instructors. The days were split between morning sessions, led by Ole Kingston, and afternoon sessions, led by Iida Hiroo, with an introductory session being held on Friday evening. 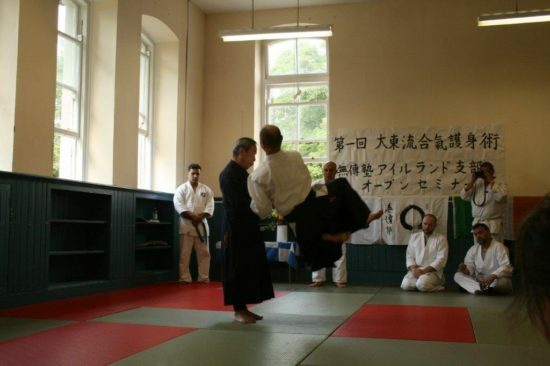 Ole’s main emphasis for his sessions were on the aiki jujutsu portion of the art. 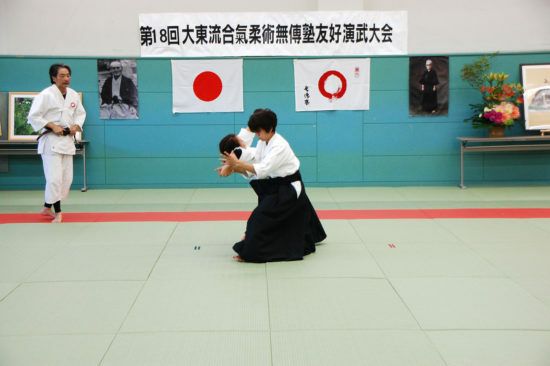 These included techniques that used sophisticated methods of timing, breathing, use of the eyes and intent to effect kuzushi (the breaking of balance) on the opponent. 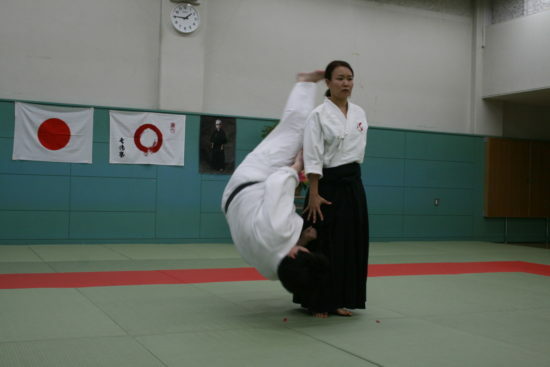 In aiki jujutsu, little physical effort is needed to disrupt the opponent’s balance or will to attack. 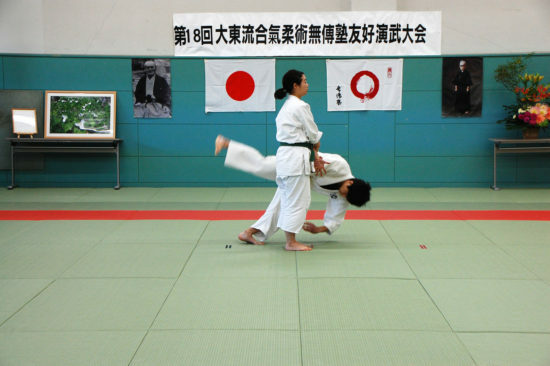 Minimal movements are focussed on specific areas of the opponent’s body, often the joints, known in Japanese as kansetsu waza. Ole sensei also taught very much by feel, throwing everyone in attendance in a line (known as rinban keiko in Japanese). 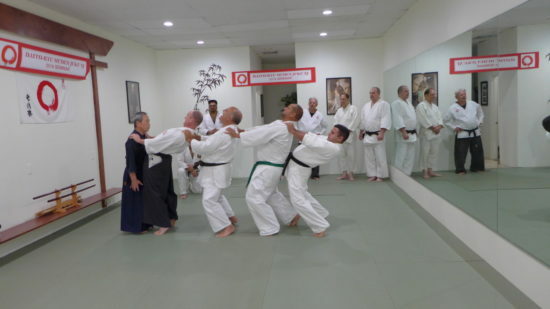 Then we divided into three smaller lines to practice the techniques with each other. The emphasis was on smoothness and repetition of execution. Ole often showed ‘sets’ of techniques, which were basically the same techniques done for a particular attack (e.g. a one-handed grab) but were executed using different modes of movement, from relatively large and expressive to small and refined. 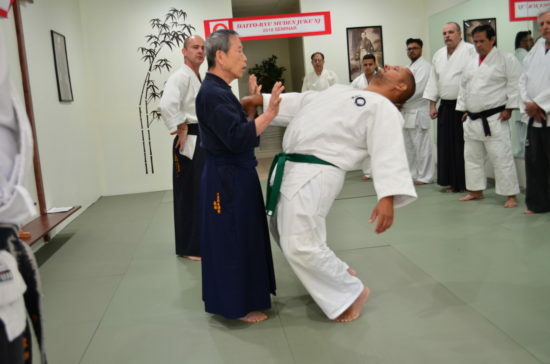 One reason for this kind of training was to help ‘burn in’ the smoothness of the movement needed to do the techniques correctly. Also, by repeatedly recieving these techniques in a line, one could feel the movements within one’s body feel where their balance was disrupted. 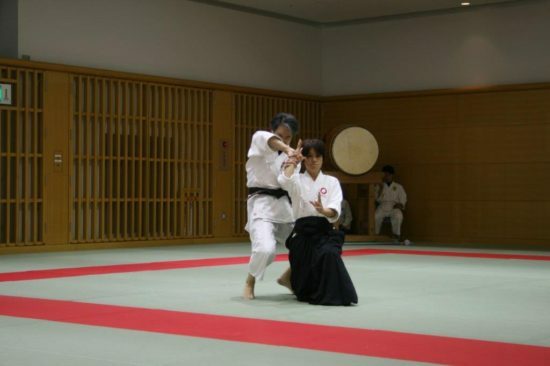 A special emphasis on Ole sensei’s classes was achieving this smoothness in executing techniques, which is based on a deceptively simple principle called ‘no-shi’. 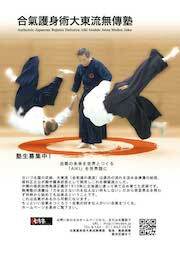 This is a kind of spiral motion that is expressed by the hands but is ultimately created by the correct use of the whole body. It’s a multi-faceted concept that applies to many aspects of practice, such as breathing and body usage. 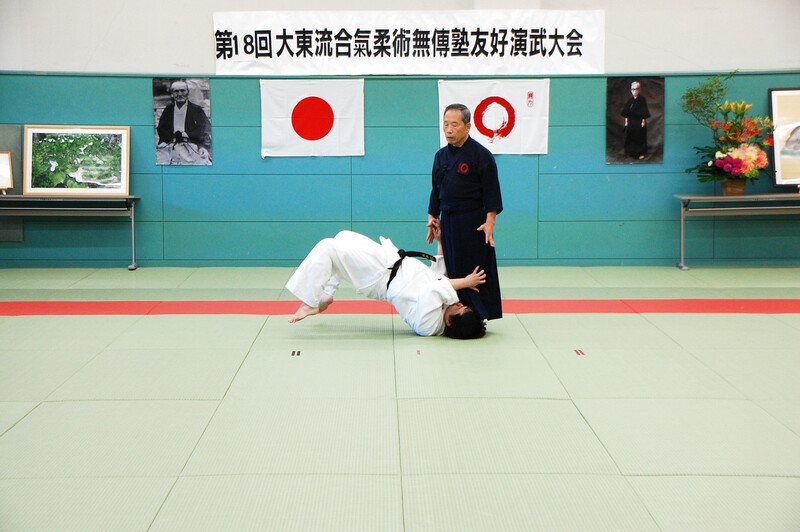 Ole demonstrated that the first part of this movement (‘no’) unbalances the opponent and can even momentarily stop their breath, while the second part (‘shi’) follows the technique through to the end either as a throw, lock, strike and so on. However, these should be executed as two aspects of the one movement! 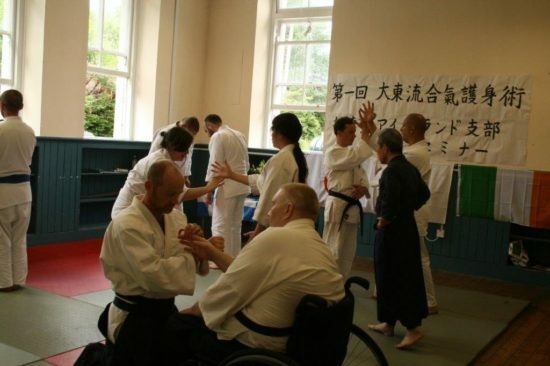 Even in this basic teaching there was a wealth of practice and information for people to work on. Ole’s teaching was at a very sophisticated level. 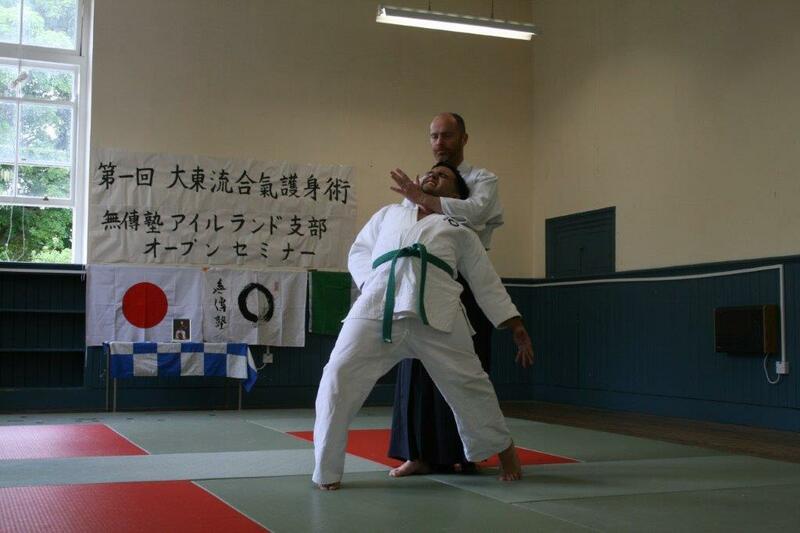 The aiki jujutsu level of the art is rarely taught and demonstrated so clearly, especially to first time practicioners. 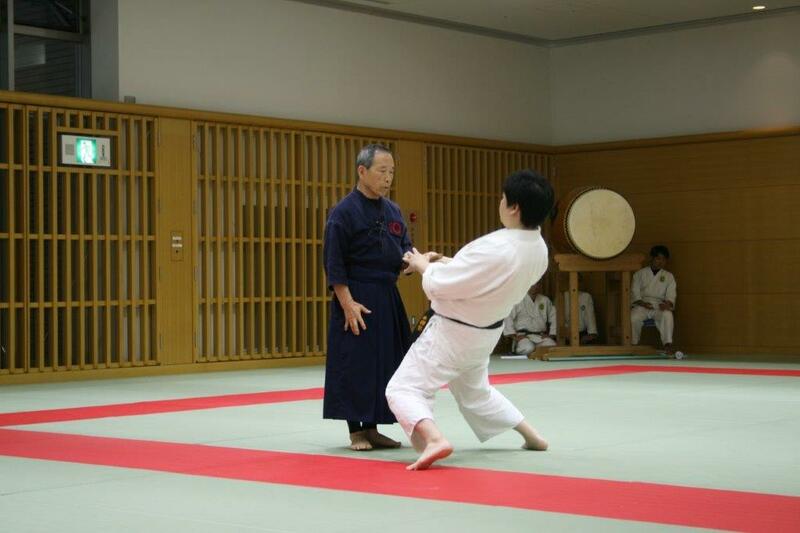 Iida sensei’s portion of the seminar extended that sophistication to encompass the aiki no jutsu portion of the art. 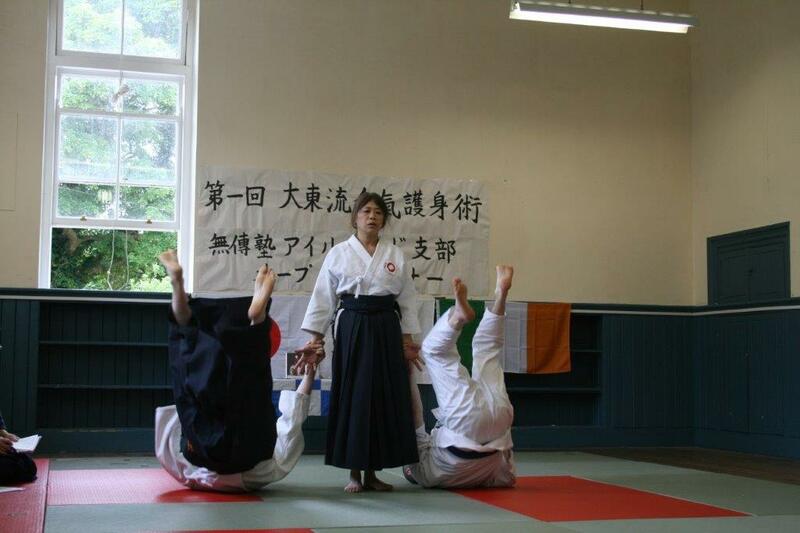 The Three levels of Daito Ryu: Soden, Chuden and Okuden. This three-level stage of training is quite common in many authentic Japanese arts. In the practice of shodo (Japanese calligraphy) for example, practitioners begin by practicing brushing script in the Kaisho level. The script that practitioners brush/write at this level are characterised by strong clear and precise strokes. 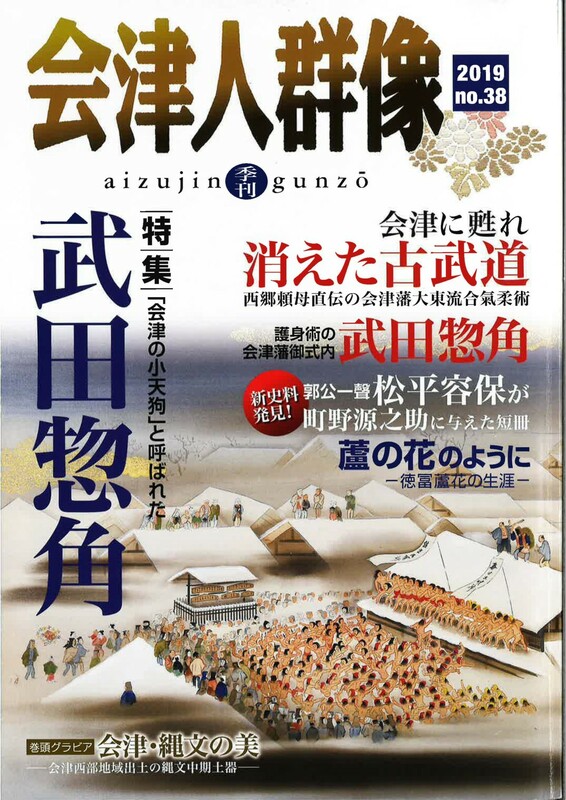 Then they move onto gyosho in which the brushwork becomes more fluid as practitioners begin to grasp how the characters in Japanese script work and fit together. Finally, after many years of practice, master level calligraphers achieve the level of sousho, in which their calligraphy and their vital energy becomes fused into their work. 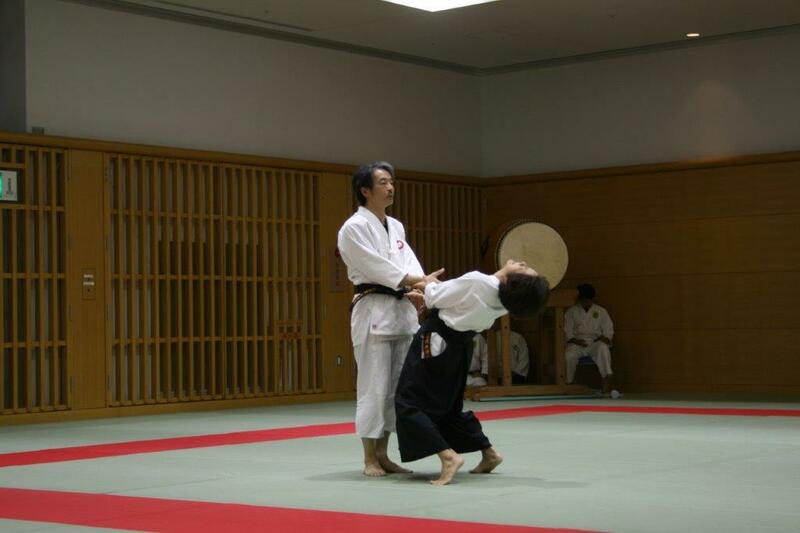 Traditionally, when one joined a Daito Ryu school, one moved through three levels of initiation. 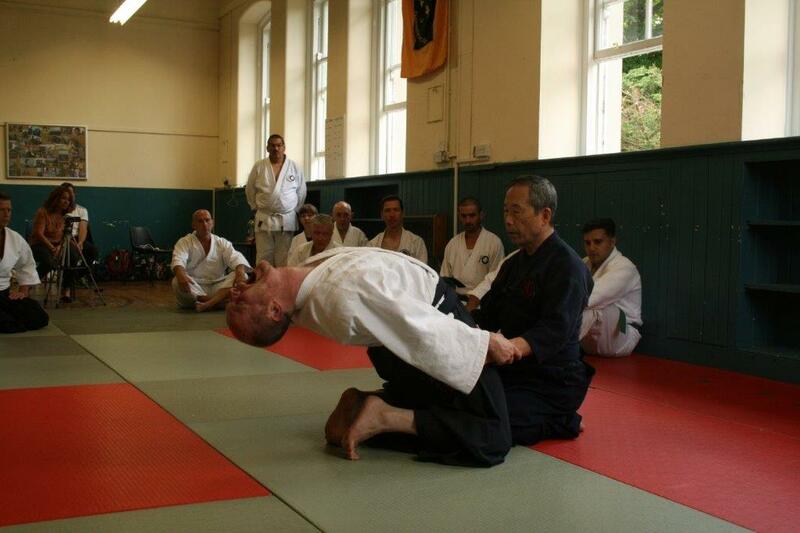 The first level of this was the soden level at which practitioners learned jujutsu. 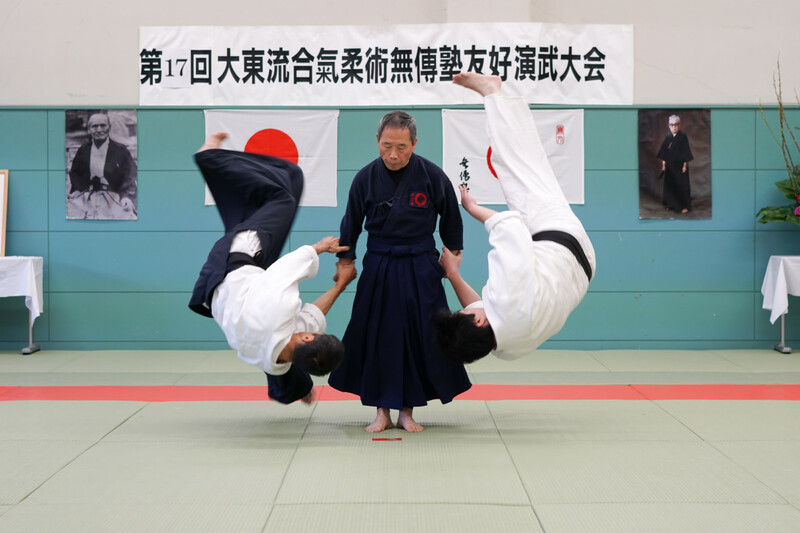 This included powerful locks throws, groundwork and strikes (known as atemi) that were not dissimilar from other schools of Japanese jujutsu. After a period of training, (up to ten years), practitioners were graduated to chuden level and were introduced to the aiki jujutsu portion of the art. At this level, jujutsu techniques start to be performed using aiki, as opposed to normal muscular strength. At this level, many of the techniques became smaller, and thus could be performed in smaller spaces. Aiki jujutsu techniques lock up or throw the opponent by attacking their joints momentarily with aiki. Aiki is a deep concept for which there is no English translation, but it incorporates elements of breathing, timing, reflexes, psychology and body movement. 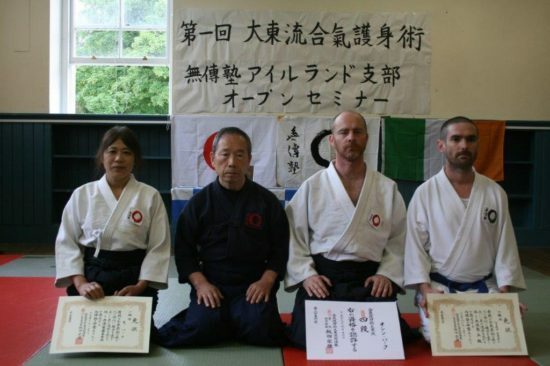 Finally, some of the most advanced practitioners of Daito Ryu graduated to the okuden level of the art and learn the techniques known as aiki no jutsu. 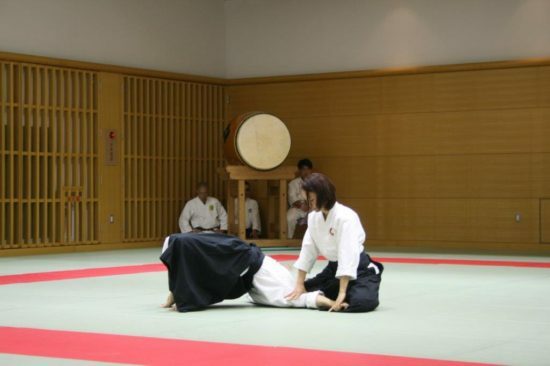 This is a level in which the internal practices introduced at the chuden level have become so integrated into the practitioner that the practitioner barely moves externally. Internally however, the practitioner is using intent, breathing and connection to organise themselves to deal with incoming force and to generate unified, compacted energy. 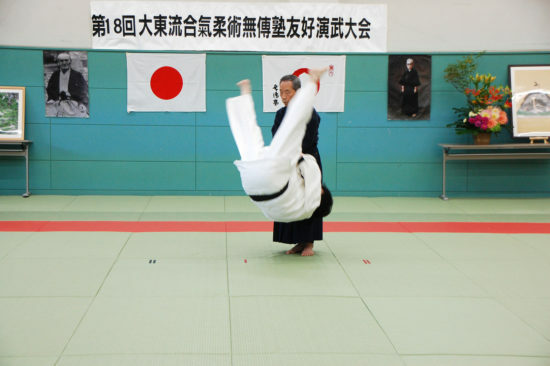 The opponent is unbalanced, locked up, thrown or even frozen, cramped or compacted at the moment of contact, often before they are even aware of what has happened. At the level of aiki no jutsu, the sharp aiki techniques used to attack joints at chuden level flow into the opponent’s whole body. The sensitive opponent grabs or attacks, but suddenly feels like a huge powerful force suddenly appears somewhere within them, sometimes feeling like a great weight, sometimes like an uprush of wind and sometimes like an explosion, all going on deep within their body. 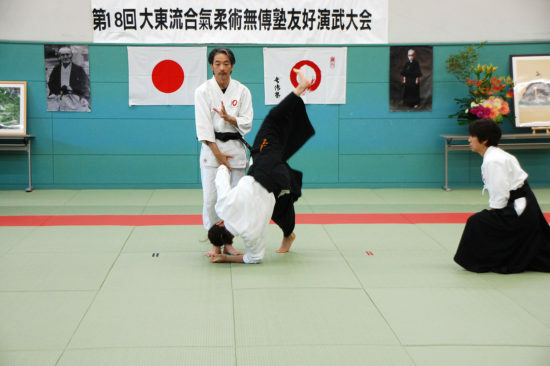 Often when receiving an aiki no jutsu technique, a beginner will fall or lose their power without being able to understand what has happened to them. It feels as if they just fell over. To the outside observer, it certainly seems like nothing is happening between uke (the attacker) and tori (the thrower). This is linked to the historical development of the Daito Ryu style, which evolved as an art special to the Aizu samurai clan of Northern Japan. High ranking members of the Aizu used the art as a self-defence art for formal indoor situations. 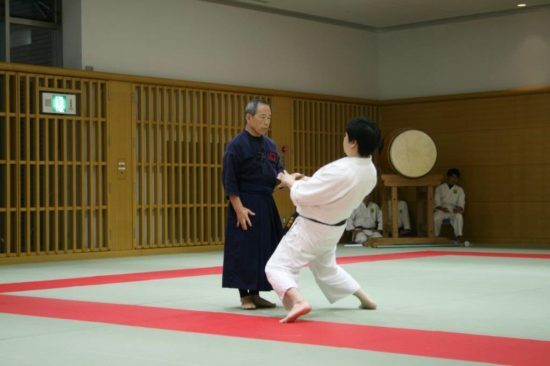 These situations demanded minimal movement and a calm, settled spirit, steady breathing and a highly developed usage and control of one’s body and mind. 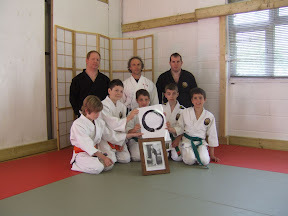 Iida sensei’s section of the seminar concentrated on the aiki no jutsu portion of the art. 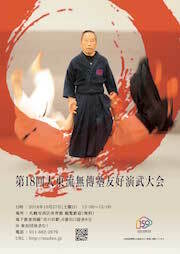 He emphasised the type of practice required to develop this level of the art. He stressed the importance of correct form or kata in practice. 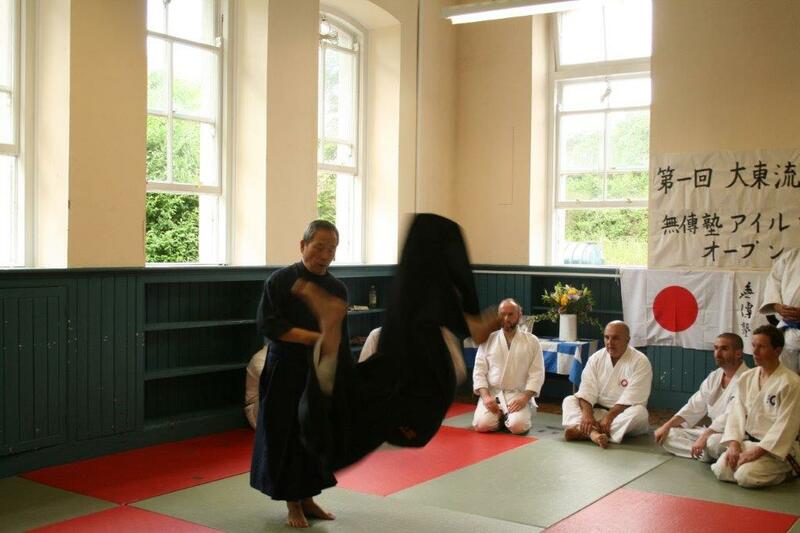 This type of kata geiko requires often repetitive, mindful attention on the part of both uke and tori as one starts to integrate breath, intent and internal connection need to neutralise and redirect uke’s incoming force. 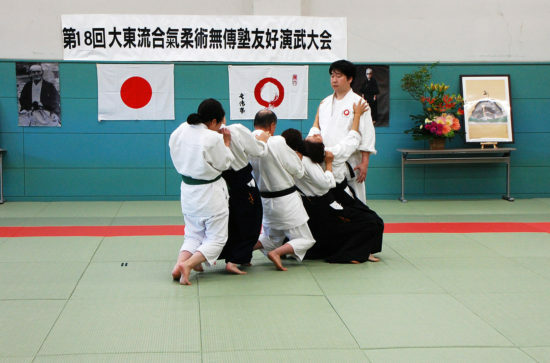 To this end, we concentrated on the first day on a series of paired practices to develop aspects of the body, in particular the chushin, or centre line. 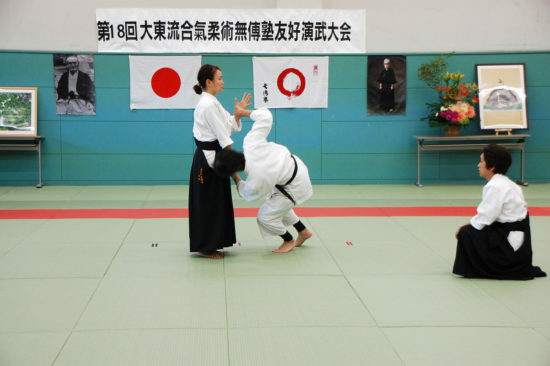 This central line of the body must be unified for the aiki no jutsu level techniques to make sense. This is because aiki no jutsu techniques cannot utilise normal, gross muscular power due to their minimal movements. Grasping this concept must be done on a physical and mental level and this requires special training method. 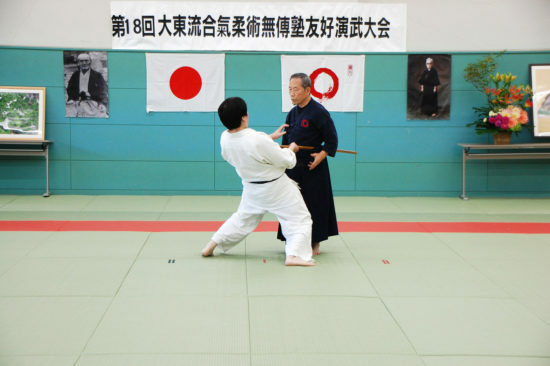 Iida sensei also explained the crossover with these principles found in some schools of Japanese swordsmanship, or kenjutsu. Iida sensei made mention of kuden, or oral teachings in traditional arts to help inculcate the correct movements and body usage based on the principles expressed in natural. 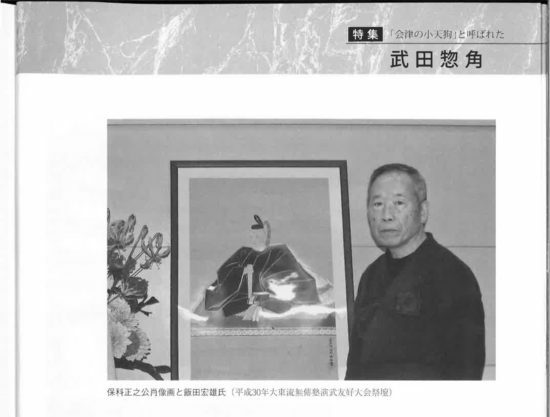 Iida sensei’s emphasis was not on the large, dramatic movements that many identify with Japanese budo arts. 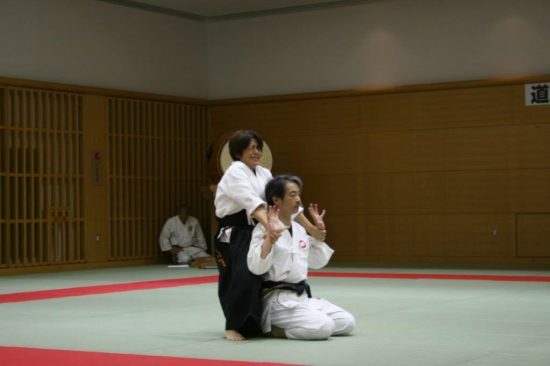 Instead, he concentrated was on developing a soft yet connected, concentrated body and mind that could gather and express aiki. For Iida sensei, this is the essence of Japanese arts and their training methods, akin to and ‘old style’ or ‘koryu’ method of movement and training. 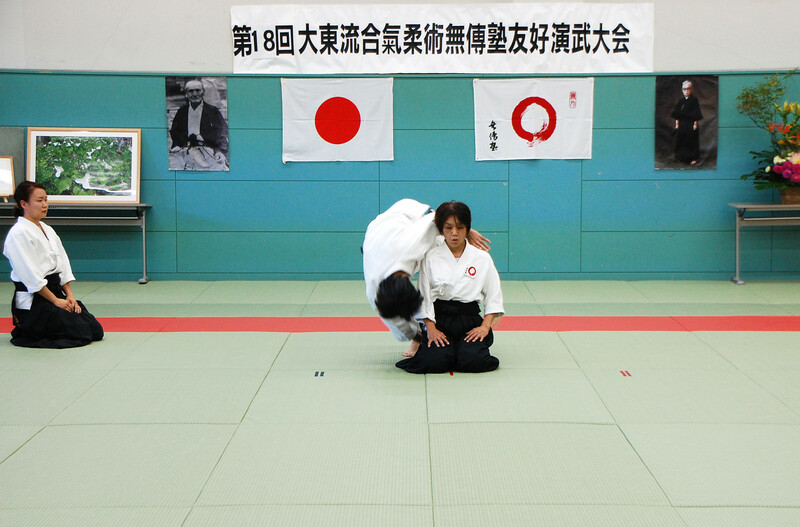 On the final afternoon, Iida sensei introduced some techniques that could be executed with minimal movement in order to help manifest aiki no jutsu in application. 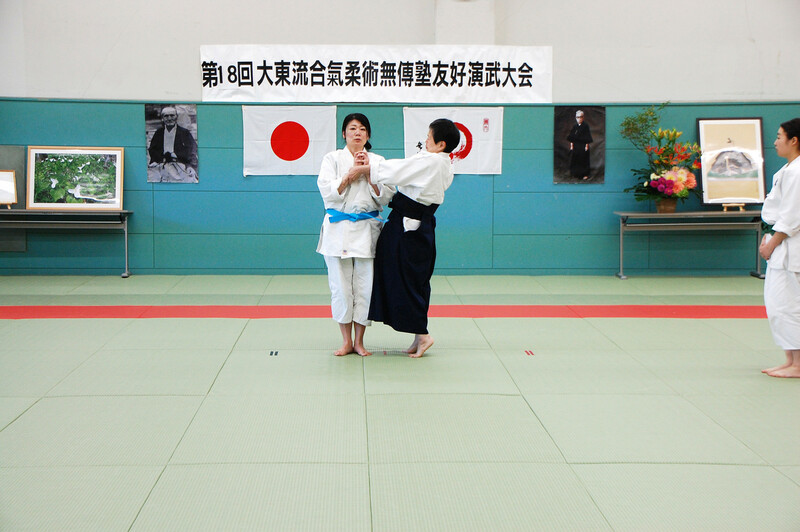 The approaches of both teachers helped inform the other. Where Iida sensei’s emphasis was on development, Ole’s was on expression. 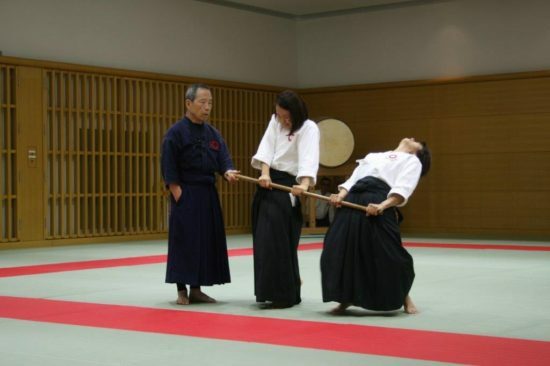 Where One approach helped make one aware of movement, the other made you more aware of internal connection. 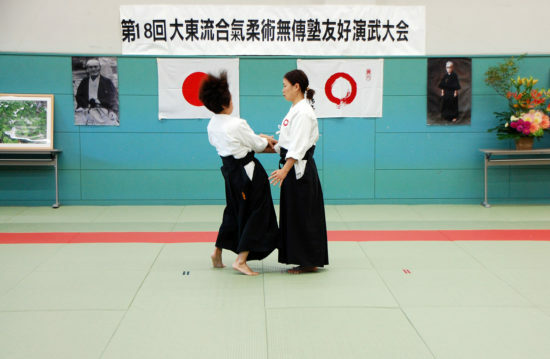 Where one emphasised the feeling from receiving a technique, the other emphasised the cultivation of feeling in oneself. Both approaches gave insights to practitioners that weren’t usually shown. More importantly, the feelings, concepts and body organisation introduced will hopefully provide a foundation from which attendees can develop for years to come. Many concepts introduced were very high level and left some practitioners conceptually confused, yet I believe that the training planted seeds within the body of each attendant that will bear fruit in years to come. My sincere thanks to everyone who attended this unique event, and my commiserations to those who missed it! 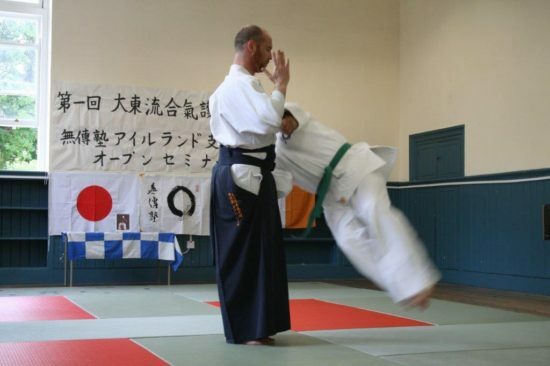 Oisin Bourke is a shibucho (branch director) for the Ireland branch of Muden juku, a group that practices traditional Daito Ryu Aiki jujutsu under the auspices of Hiroo Iida, Shihan. 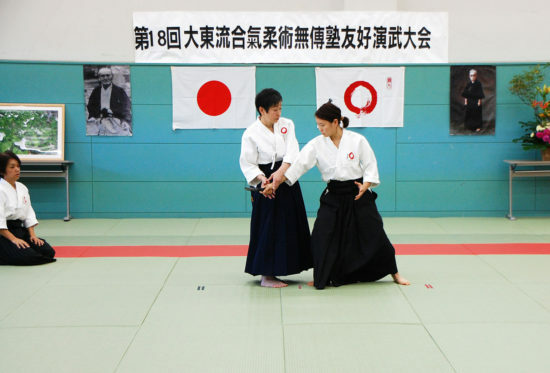 The headquarters of the Muden Juku is based in Sapporo, Japan. 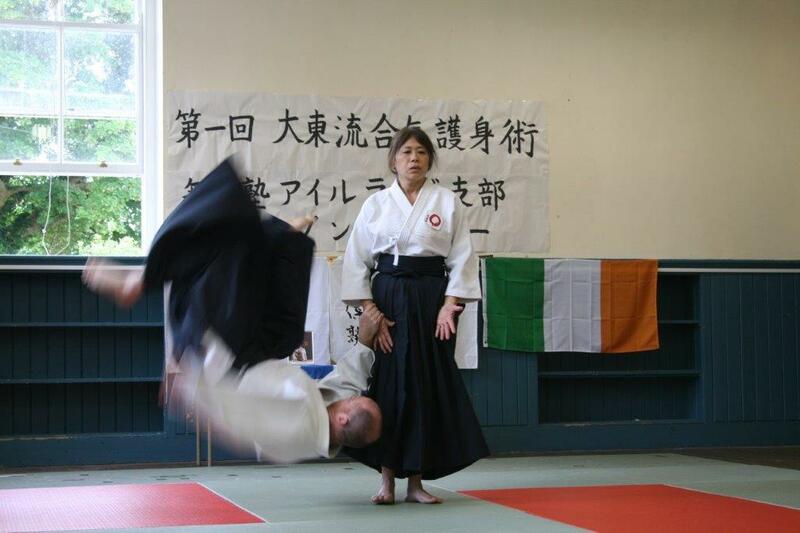 Oisin Currently holds the rank of Fourth Dan in the art and teaches at a dojo in kilkenny, Ireland along with Megumi Bourke, who holds the rank of Okugi Sandan (inner level third dan). A practitioner of Daito Ryu Muden Juku Ireland Branch, Megumi Bourke, demonstrating a technique. 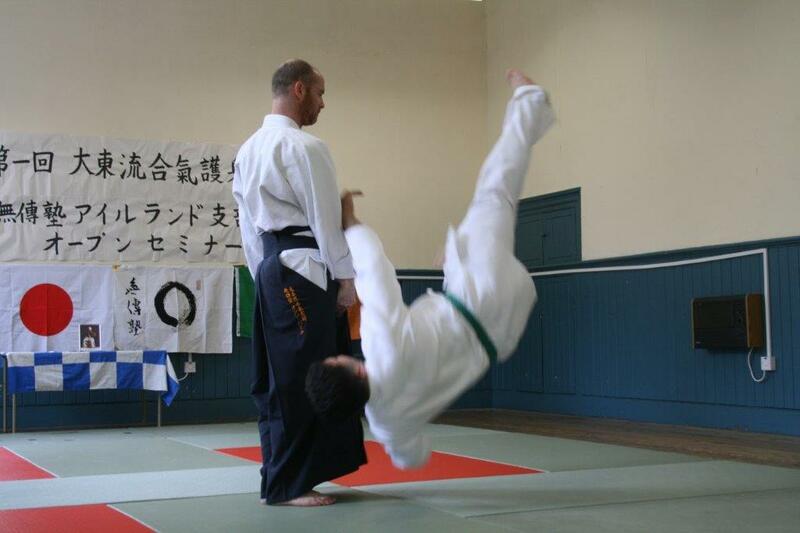 Using aiki, one does not need to rely on brute strength. 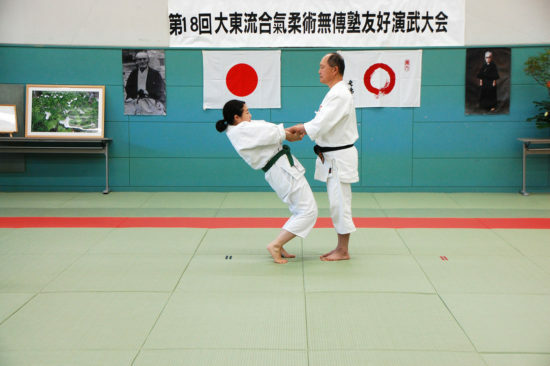 Daito Ryu techniques are therefore beneficial for men and women of all ages. Daito Ryu Muden juku Ireland Branch member Oisin Bourke demonstrating an aiki technique for his Fourth Dan (Yon Dan) grading demonstration. Correct posture and use of body is vital at this level. 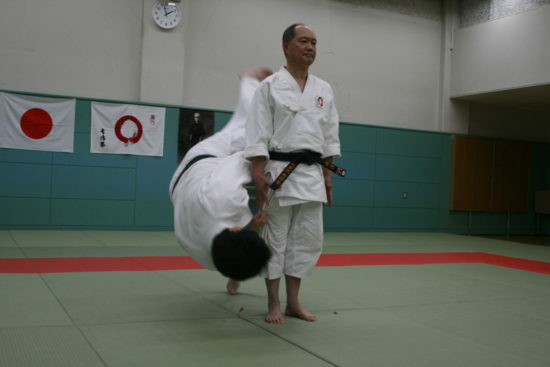 Hiroo Iida, shihan of Daito yu Muden juku demonstrating a two person throwing technique. 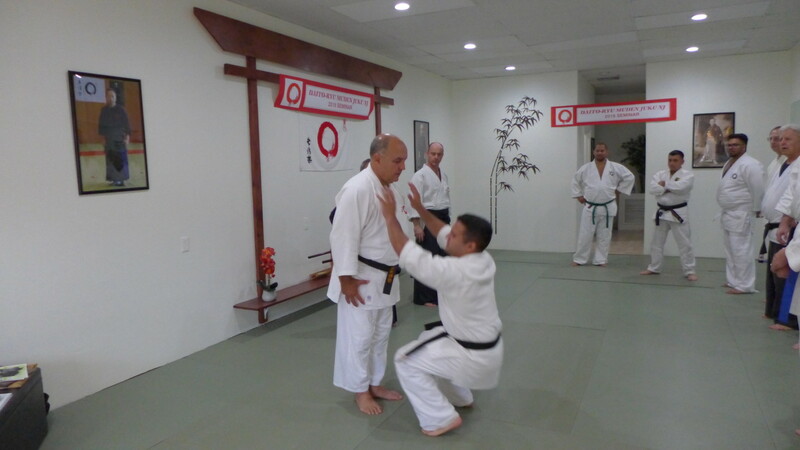 Practicing an exercise to develop chushin (center line) connection while iida Sensei looks on. 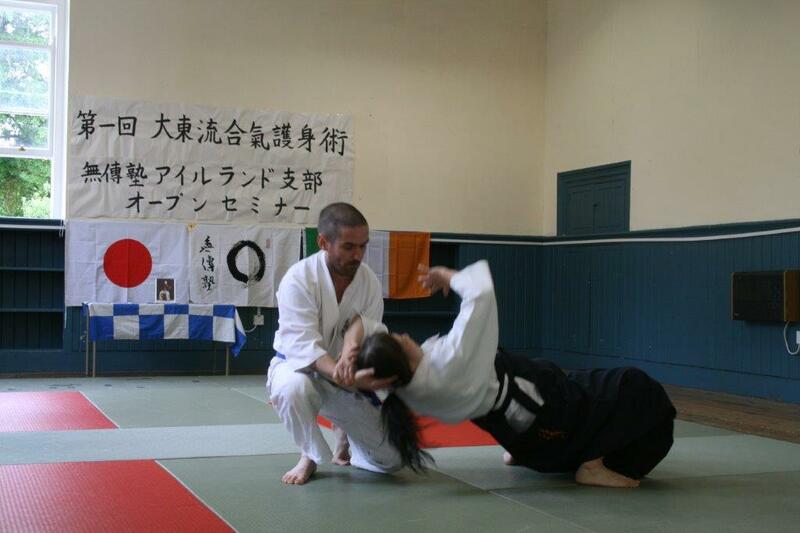 Ole Kingston sensei teaching and demonstrating an aiki jujutsu throw participants in line practice (rinban keiko). Excellent Sminar Very well organised with a fantastic atmosphere!! Amazing!! Fantastic Seminar Host By IIDA Sensei and well organaised by Oisin,Megumi and all who have participated in the organization. Very Nice!! You don’t to be Big or Strong. 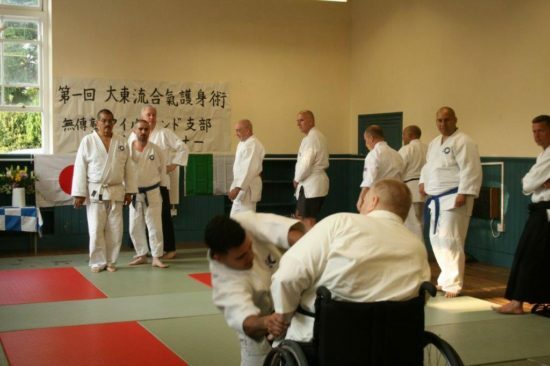 You just have to belive and learn Aiki. Good energy. Good encounters. Good relationships.